PRESIDENT TRUMP: Russia’s very unhappy that Trump won. That I can tell. CHUCK TODD: Attacked the Democrats. PRESIDENT TRUMP: They'll do anything they can to do-- really, to obstruct or resist. CHUCK TODD: Is this a sign the president is feeling liberated in his job or besieged by the growing pressure of the Mueller probe? Plus securing our election. Even after top U.S. security officials say this. FBI DIRECTOR CHRISTOPHER WRAY: Our adversaries are trying to undermine our country on a persistent and regular basis. DHS SECRETARY KIRSTJEN NIELSEN: Our democracy itself is in the crosshairs. CHUCK TODD: President Trump says this. PRESIDENT TRUMP: Now, we're being hindered by the Russian hoax. CHUCK TODD: So, hoax or threat? What does the Trump administration want us to believe? My guests this morning, Republican Senator Roy Blunt of Missouri, Democratic Senator Amy Klobuchar of Minnesota, and NBC News National Security Analyst Clint Watts. Also, the Trump loyalty test. Hugging President Trump has become the Republican go-to strategy. RON DESANTIS: Then, Mr. Trump says, "You're fired." I love that part. CHUCK TODD: It works great in the primaries, but will candidates pay a price in November? I'll ask longtime Republican adman Mike Murphy. Joining me for insight and analysis are Robert Costa, moderator of Washington Week on PBS. Helene Cooper, Pentagon correspondent for the New York Times. Republican strategist Al Cardenas. And Politico's Eliana Johnson. Welcome to Sunday. It's Meet the Press. ANNOUNCER: From NBC News in Washington, the longest running show in television history. 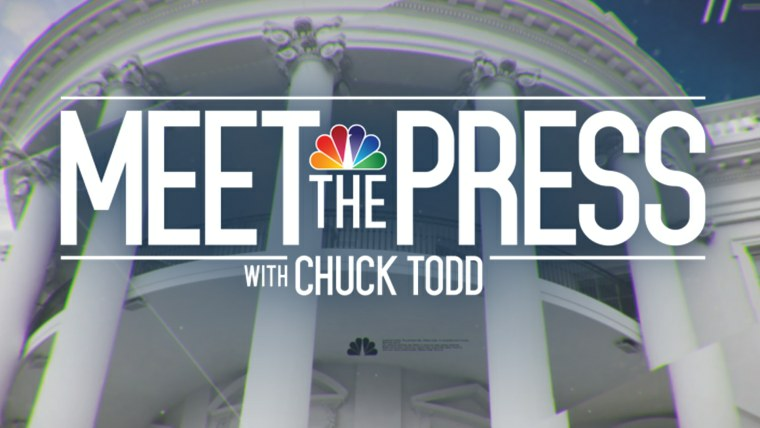 This is Meet the Press with Chuck Todd. CHUCK TODD: Good Sunday morning. One of the questions that emerged during the 2016 presidential campaign was this. Should we take Donald Trump seriously or literally? Well, now he's president of the United States. So, are we supposed to take him seriously or literally when he says that the Mueller investigation that his attorney general should stop what he calls this rigged witch hunt right now? Are we supposed to take him seriously or literally when, hours after his intelligence and security chiefs say that the U.S. election integrity for 2018 is still under attack from Russia, the president tells a rally that the Russia investigation is a hoax? Are we supposed to take him seriously or literally when he calls legitimate journalism fake news? And says the press is the enemy of the people and even can cause war? And what are we supposed to make of the ralliers (BACKGROUND VOICE) devoted to the president, who heckle reporters, wear t-shirts, say, "F the media," and flash middle fingers at TV news cameras? Are we supposed to dismiss them? Or should we take their anger seriously? President Trump supporters say, "Don't take the rallies seriously or literally. They're just WrestleMania-like entertainment. Cue mean Gene Okerlund." The White House says, "Don't take the president's tweets seriously or literally. They're not policy. They're just the president's opinion." In other words, the president's supporters have resorted to excusing his behavior as opposed to attempting to defend it. It's hard to know whether we're supposed to take that seriously or literally. PRESIDENT TRUMP: The Russian witch hunt. A Democrat-inspired witch hunt. CHUCK TODD: At a campaign rally in Ohio last night, the president unleashed his latest series of attacks. PRESIDENT TRUMP: Maxine Waters is leading the charge. (NOISE) A seriously low-IQ person. The fake news media. Democrats are obstructionists. The only thing they do well-- they're lousy politicians. They have horrible, stupid policies. They are haters. CHUCK TODD: The lashing out, a sign of a president who appears increasingly ratted. On Wednesday, Mr. Trump made his most direct call yet for an end to the Mueller investigation, tweeting, "Attorney General Jeff Sessions should stop this rigged witch hunt right now." His lawyer quickly claimed the tweet was not evidence of obstruction of justice, but then argued the president could obstruct justice if he wanted to. RUDY GIULIANI: If he wanted to obstruct it, he'd obstruct it. I mean, he could just end it. And then-- then you'd all battle whether he has the legal right to do that, which I think he does. But he's not going to do that. CHUCK TODD: Mr. Trump's attacks are escalating as his associates face mounting legal jeopardy. The bank and tax fraud trial of his former campaign chairman began this week with prosecutors presenting evidence that when money from a Russia-friendly Ukrainian political party dried up, Paul Manafort became desperate for cash, raising the question of why he agreed to an unpaid job with Mr. Trump's campaign in 2016. At the time, Manafort talked about the access that campaign offered. PAUL MANAFORT: They're coming to me to find ways to get into-- the Trump campaign. MALE REPORTER: You're saying more people wanna get involved. PAUL MANAFORT: People that I know, they wanna get involved. Yes. PAUL MANAFORT: And wanted to before but didn't have a way in. CHUCK TODD: One Republican tells Vanity Fair, "The Manafort trial is spinning him into a frenzy." Then, there's the threat from his former lawyer Michael Cohen, who's signaled he might strike a deal with prosecutors and spill the president's secrets. And the special counsel is interviewing more associates of another longtime Trump campaign aide, Roger Stone. For months, Mr. Trump has had one relentless talking point. PRESIDENT TRUMP: You can-- there was no collusion at all. No collusion whatsoever. No collusion. No collusion. Absolutely no collusion. CHUCK TODD: With mounting evidence of contacts between Mr. Trump's campaign and Russia, this week, the president's attorneys tried a new argument. RUDY GIULIANI: Collusion is not a crime. I don't even know if that's a crime, colluding about Russians. JAY SEKULOW: Collusion is not a crime. CHUCK TODD: Mr. Trump echoed, quote, "Collusion is not a crime. But that doesn't matter because there was no collusion." In a PR cleanup attempt, the administration's top intelligence officials held a briefing Thursday at the White House, vowing to combat Russian interference in the midterms, now just over 90 days away. CHRISTOPHER WRAY: This threat is not going away. DAN COATS: And we're doing everything we can to have a legitimate election that the American people can have trust in. PRESIDENT TRUMP: We're being hindered by the Russian hoax. It's a hoax, okay? CHUCK TODD: Joining me now is Republican Senator Roy Blunt of Missouri, who's not just a member of Republican leadership but also sits on the Senate Intelligence Committee, so we wanna get into some election security issues there. Senator Blunt, welcome back to Meet the Press. Before I get into that-- sometimes, I-- I try to ignore his attacks on the press. But this morning, he seemed to go a bit overboard with this tweet. And I wanna get you to respond to it. "The fake news hates me," saying, "they are the enemy of the people only because they know it's true," and puts that in all caps. "I am providing a great service by explaining this to the American people. They purposefully cause great division and distrust. They can also cause war. They are very dangerous and-- and sick." Senator Blunt, I know this is not your point of view. I'm not-- but at what point is this rhetoric to the point where it should stop, in your mind? Well, it-- it's not-- not my point of view. You know, I see the media, the press, every day, in the capital, walking through-- by-- to my office, to the floor. Lots of questions. Generally, really good questions. I do think there is so much news out there, it's harder to focus in if you're part of the media than it may have been at one time. And if you watch TV every day, you could find some things that you, on-- on various news channels, you would-- found objectionable and probably believe not to be-- not to be true. I-- it-- the president's-- rallies, people seem to respond to that. I-- I would say that. I've not been to one of these rallies. But I've watched them. And that seems to be something that a lot of Americans identify with. I think all of us who try to communicate need to realize there's some real challenge out there of who believes what we say and how we say it, whether that's you or me. Yeah, but at some point, when you call a group of people, you other-ize them, the way he's trying to do with the press. Calling them sick and sort of dehumanizing them. It makes violence against the press easier to rationalize for some. That's the concern that many news organizations have right now. Two wrongs make a right, here? I mean, he's the president of the United States. He's the leader of the free world. But you know, there's a lot of in-depth psychology that goes on on some news stations every day too. I'm not sitting here, condoning that. But I guess, so because the president doesn't like some blogger that shows up on cable television at night? --this topic. And you know, it's not the way I would approach this. And I think, not the way you and I would approach it. I know, I guess the question is how do you convince the president that this is bad rhetoric? That this is dangerous rhetoric. Not just, you know, bad decorum. Mm-hm. Do you believe that? You can certainly -- there's a vast variety of how the same news is reported. So, that middle of the road news that people my age grew up with is no longer the news. Well, I would respectfully disagree there, particularly on this show. But I wanna ask you to respond to something else. Pete Wehner, longtime Republican speech writer, he tweeted this about the president and his constant attacks on African-American activists, including athletes like Lebron James. And he tweeted this. "Trump's made the same criticism of black athletes, black journalists, and black members of Congress," referring to Maxine Waters. "He attacks their intelligence. His racist appeals aren't even disguised anymore. The closest figure in national modern politics to Trump, George Wallace. Trump now defines the G.O.P." Are you concerned that the president is defining the G.O.P. as anti-black? It's always with an African-American when he questions intelligence. That's what makes a lot of people uncomfortable with what he's doing. I don't think always. I mean, look at what he said about his various opponents in the Republican primary. Sounds like you embrace her, though, as a proud daughter of Saint Louis. I embrace her as a person who has given a lot of time to public service and has a different viewpoint that I do, but it's not a viewpoint that's not based on her factual view of the world. Let me go to the issue of election security. Here was Christopher Wray and Dan Coats at the White House a couple days ago. Here it is. Russia attempted to interfere with the last election and continues to engage and malign influence operations to this day. We continue to see a pervasive messaging campaign by Russia to try to weaken and divide the United States. You're on the intelligence committee. I assume you've heard many of these same updates, probably with more specificity than we have. What's your level of concern about interference in the 2018 elections based on the briefings you've been receiving and what you heard? Well, I'm on the intelligence committee. I also chair the Rules Committee. Senator Klobuchar is my ranking Democrat. We still need some paper ballots, though. We still have some states that don't have, sort of, a backup paper ballot system. And I think there's an election bill. I think it's Senators Lankford and Klobuchar together on this. Where are you on that? I believe we should have an audit trail. Should the federal government help fund that? --actively part of that discussion as it came. Until it got before the full appropriations committee. I wish we'd have been more specific on that. But that's money that states hopefully will use to make that transition. Why'd you vote against the election security bill that was there this week? What was your concern with it? You want it more specified, is what you're saying. More specified. And I don't want this to become an annual entitlement. You know, the worst possible kind of funding is distant money and local decision making on how to spend it. That $380 million is what we were told last year by Homeland Security and state officials that they needed. It's barely out the door. They have five years to spend it. I want to have things like an audit trail that people can have confidence in. --even this time than they were last time. Well, and a final question here. The sanctions bill from hell, as Lindsey Graham likes to call it. Are you on board? I'm on board with sanctioning the Russians. I guess his is tougher. I haven't looked at his bill yet. I did ask General Nakasone, who's the cyber command and NSA Director, in March, "Do you have what you need to respond if we are attacked? Do you have an offensive strategy?" In March, he said no. His predecessor, under President Obama, said no. This week, he said yes. That is a big step, I think, in the right direction. And the Russians, the Chinese, the North Koreans, any of the other seven actors that principally are doing this kind of activity, should listen very carefully to what General Nakasone said. As well as what other people said this week on this topic. --and sharing your views. Joining me now from Minneapolis on the other side of the aisle, Democratic Senator Amy Klobuchar of Minnesota. Senator, welcome back to Meet the Press. Let me stick to election security there. You heard Senator Blunt's concerns about the bill this week. It was essentially unmarked money. And it sounded like that was many of the Republicans there. What would you say in response to that? Essentially, he's saying he'd support more money if it's specified for what it is rather than an annual semi-entitlement. What do you say? We were simply listening to the Secretary of States of the states in this nation. And they said that they needed more help. And we think it's paramount we act quickly, given that we now have the intelligence heads for the United States government in an unprecedented move all going to the White House and saying that this is happening now. We have a common set of facts. And that's why as we move forward, I'm glad that we were able to get the $380 million out to the states. 47 states now have their funding for things like backup paper ballots. But we also need to get the Secure Elections Act passed. And that's what my friend Roy Blunt was talking about there. We're going to be voting on that bill finally in committee. And that's going to allow us to require backup paper ballots of the 14 states that either have partial or don't have them at all. Right. Let me get you to respond to something the Director of National Intelligence, Dan Coats, said about this election. Take a listen, Senator. Our focus here today is simply to tell the American people we acknowledge the threat. It is real. It is continuing. And we're doing everything we can to have a legitimate election that the American people can have trust in. Senator, I have to say it's that last phrase that sort of sent a little bit of a shiver down my spine: “so that we can have a legitimate election.” It wasn't a guarantee yet. How confident are you that the 2018 midterm elections are going to be legitimate? I am very concerned that you could have a hack that finally went through. You have 21 states that were hacked into. They didn't find out about it for a year. And that's one of the reasons that we want to pass our bill, so that there's now a requirement that they tell the individual Secretary of States immediately so they can protect themselves. And I think you also have the fact that you've got the president undermining this on national TV. Still, after his security people, General Nakasone, that they go in front of the world, and they say this is happening, he says that night at a rally in Pennsylvania that it's a hoax. So, that concerns me. But at the same time, there are some very good people working on it. I'd love to see this broadened out, so we start to discuss also the threats to our power grid system, the threats to our financial system, because the Russians aren't just stopping at the election equipment. Is the president's comments undermining national security when he does that? --between at least Democrats and Republicans in the Senate and a common purpose to protect our democracy. All right. I want to get a couple political questions in here. I'm curious of your response to something Cynthia Nixon said this weekend at the Netroots conference, gathering of progressives, a lot 2020 chatter there, and we can get into that. But something she said about socialism. I'm curious of your reaction. The establishment is terrified of that word. Socialism. But if we learned one thing from the Obama years, it's that Republicans are going to call us socialists no matter what we do. So we might as well give them the real thing. What do you make of that? And where do Democratic Socialists fit in your Democratic party, Senator? --to Bernie Sanders. And I see a lot more unity than I do divide. Elizabeth Warren said something also yesterday. She said, "The criminal justice system, from start to finish, is essentially racist." You were a part of the criminal justice system, a former County prosecutor. That's a large charge. I understand where she's going there. Is that a fair hit? For people who have been victimized and have been a victim of crime, they need a criminal justice system that works for them. And I have worked with a lot of very good prosecutors and very good police officers that do some of the hardest jobs every day. But we know that there is racism in the system that needs to be fixed, that's why we have started instituting body cameras, which is a great solution, doing things on eyewitness ID, and I think the solutions are there for us. We just have to reform the system. Senator Klobuchar, as always, thank you for coming on, sharing your views. We'll be right back. Midterms. Welcome back, data download time. As we near the end of primary season, one storyline has been dominant in state after state. The Democratic turnout surge. Just this week, the Pugh Research Center released numbers showing that through the June primaries, 13.6 million had voted in Democratic primaries. That was a whopping 84% increase over the 2014 midterms through the same period, while 10.4 million voted in Republican primaries. By the way, that's also an increase over 2014 as well, but only a 24% increase. To be clear, primary elections are often very different animals from generals. But the numbers do provide at least some understanding of how engaged the two political party bases are at this point in the cycle. The fact that more people voted in Democratic than Republican primaries so far in 2018, it flips the script from what we saw in 2014. Which of course was that big wave year for Republicans. But the national numbers don't tell the whole story. Let's go state by state here a bit. We're going to look at California. Compared to 2014, Democratic primary voters were up 84% compared to a 30% increase for Republicans. But even more important, in nine of the ten districts seen as battlegrounds in California by the Cook Report, Democratic primary turnout increases were even bigger than those on the Republican side. But there is some good news for Republicans in that stat. They still produced more overall votes in those battleground districts. Now, Ohio? They paint a complicated picture as well. The Democratic turnout increase was greater than the Republicans. But Republicans still held the advantage in the raw number of votes cast in Ohio. In fact, in four of that state's five battleground Congressional districts, Democrats again saw a bigger increase. But in all five, it's the Republicans that still had more votes cast overall. Potential sort of buffer there for the G.O.P. Now, let's go to Iowa. This may be the most interesting set of numbers we've seen. The Democrats (LAUGH) saw a massive increase in turnout, 152%. While Republicans saw a steep drop, 35%. Now, Republicans want to argue that this was because of a lack of contested races down the ballot. And let me tell you, privately, some ire Republicans are muttering the word "tariffs" as the explanation for dampening rural turnout in Iowa. Look, all of which is to say this. The big primary vote bump for Democrats is noteworthy, but it's still hard to know what it will mean for November. Clearly, there's enthusiasm. But is it enough to get them over the top? But at the very least, these national numbers offer some evidence that at this point, the Democrats do have an edge going into 2018 November. When we come back, the panel will be here to talk Russia, election security, and a president who seems to be feeling the heat. Welcome back, panelists here. Republican strategist, Al Cardenas. Eliana Johnson, national political reporter for Politico. Helene Cooper, Pentagon correspondent for the New York Times, and Robert Costa, the national political reporter for the Washington Post and moderator of Washington Week on P.B.S. And also joining the panel, NBC News national security analyst Clint Watts, who's author of Messing With The Enemy: Surviving In A Social Media World of Hackers, Terrorists, Russians, and Fake News. Welcome, all. All right, we're going to divide this panel up, a little bit of politics and a little bit of tech. I want to start with the politics. The president tweeting this morning -- and Robert, I'm starting with you because he's contradicting or denying a major scoop that you had in the Post this weekend. The president is tweeting about the infamous Trump tower meeting. And he says here, let me put it up. "Fake news reporting. A complete fabrication that I am concerned about the meeting my wonderful son Donald had in Trump tower. This was a meeting to get information on an opponent. Totally legal. And done all the time in politics. And it went nowhere. I did not know about it." It’s the president admitting that his son had a meeting with Russian operatives to get dirt on Hilary Clinton. We spent the week, my colleagues Phil Rucker and Ashley Parker and I, reporting inside the White House, talking to White House officials, the president's close friends. And he may not be concerned about what happened at that meeting. But based on our reporting, he is concerned about the legal scrutiny that is now coming close to home. His son in the spotlight. Michael Cohen, his longtime lawyer, bringing up that meeting, according to our talking to people close to Cohen. So, you have all these forces coming together as the president's facing Mueller making moves, possible subpoena if he declines an interview. Eliana, what's going on here? Something White House with now legal fees is really happy about. (LAUGH) Exactly. And all aboard Air Force One, crafting a response. Something that they've been denied and now we know is not true. But I think we see a persistent theme. The president was going crazy on Twitter all week of behavior that is behaving something like-- He's behaving sort of like a commenter on a website, rather than like the president of the United States. And the excuse we get from the White House is that these are just his opinions. But as president of the United States, he doesn't really have the luxury of merely opining. His opinions have ramifications. About the news media, about ongoing federal investigations, about the Manafort trial. These are things he simply doesn't have the luxury of simply blurting out. Al, I believe you're our designated lawyer for this panel. (LAUGH) I'm curious. When you saw the president's tweet on Jeff Sessions, here. "This is a terrible situation, and Attorney General Jeff Sessions should stop this rigged witch hunt right now before it continues to stain our country any further. Bob Mueller is totally conflicted, and his 17 angry Democrats that are doing his dirty work are a disgrace to U.S.A." First of all, did you think he was tiptoeing to obstruction of justice here? When I read that tweet, I went back and looked back at the articles of impeachment for Richard Nixon. And none of it was based on breaking into a D.N.C. headquarters. It was all about obstruction of justice. Lying or misleading to investigators. It had to do with trying to intimidate those in the Justice Department or the F.B.I., C.I.A. from participating in this. Trying to get those in positions of authority in the justice system to support his point of view. And that was the crux of the Nixon impeachment. Now, you look at these tweets. There's no doubt in my mind that Bob Mueller has one prosecutor doing nothing but looking at these tweets, looking where that red line is, and see how many times they may have stepped over the obstruction boundary line. You know, it's fascinating, Helene. You now have a White House and his lawyers. They're no longer defending him, they're just simply trying to explain him. This is how they handled that tweet this week. It's not an order. It's the president's opinion. He used the medium that he uses for opinions. Twitter. He used the word should. He didn't use the word must. And it's the same thing I just saw with Senator Blunt. There is a lot of discomfort in just defending him blanketly anymore. So, if you're not going to criticize him, then you just explain him. Well, let's face it. We have a president now who's redefined in so many ways what a presidency is. In the past, when the president of the United States makes a statement, that statement is taken as the word of the United States. In many ways, it's not necessarily immediately taken as policy. But if the president said something, in the past, that was sort of in many ways a directive. We go out, as the government. You go out and do that. You don't have that anymore. What you have now is an administration that seems to be, in so many ways, at almost-- war is too strong a word -- but at conflict with the man who is leading it. So, you see them going off in these two different directions. You saw that with that extraordinary press conference at the White House on Thursday, where you have his top national security advisors presenting what seemed to be a very reasoned case. The sort of press conference that we used to have in the past, where you'd have officials talking about, you know, interference in the election. They were presenting all of the evidence, and they're talking about what they're doing about it. And hours later, you see what President Trump did. It feels like we're still using the ordinary definitions of a presidency that's anything but. That tweet was incredible in two ways. You know, all of us, if our bosses tell us, "You should do something--"
--we take that as an order. But Jeff Sessions didn't respond that way. So, it's amazing that the president's subordinates don't take his orders as orders. Let me bring Clint Watts in here. There was a nice segue to get into the technical aspect. Look, you heard Dan Coates. We want to have a legitimate election. And what he didn't say is, "The elections, we already know, is going to be legitimate." That was a little disconcerting to hear. Look, you've studied this threat. You worked on it at the F.B.I. How serious is this threat? And how concerned should we be for November? The biggest fear we should have in this country is that people don't trust institutions and elected officials. And elections are the cornerstone of our democracy. So, if there is just one state that can't audit and verify through some sort of backup its vote, it tells all of our adversaries, "All you need to do is hack in one voter database. Just try." --and you can create the conspiracy, as we saw last election, that your vote didn't count. Very easy. We've seen hackers going both at these hacker competitions and just since the election 2016, go and easily break in to different digital machines. And just creating this provocation. You don't have to hit the machines. Just hit a database. This is super simple. And the states can't defend against this. The other part of this that you've really honed in on for us, and you did it in that Senate testimony, is the social media interference. And there was a new phenomenon this week that a bunch of us had to explain to the public, something called QAnon. Right? And it is in sort of the dark recesses of social media, of sorts. On Reddit and places like that, less on Twitter. QAnon, apparently this elaborate-- it takes one conspiracy and puts them all together. Donald Trump is either this secret deep state superhero, or John F. Kennedy, Jr. who apparently they don't believe is dead. Tell us some more about these people. This has always been the big fear, is Russia opened the playbook for the rest of the world to copy. This is super cheap. And whether it's political interference and manipulation or just social manipulation, this gives everyone the ability to push a falsehood, which leads to a public safety issue. QAnon, this idea that there is a secret source inside the intelligence community. Oh my, we've worried about this before with the N.S.A. And now we're talking about them leaking information. This, again, plays into this narrative that you can't trust institutions. So, if you're a foreign interference player like Russia, what do you do? You just amplify QAnon. You don't have to make it. There is so much fake news in the U.S. right now. They don't need to create manipulated truths. They can just ride them. Believe it or not, there are numerologists too. I mean, this is sort of some rabbit hole stuff, so I apologize. But Q is the 17th letter, and 17 is their codeword. And the president is suddenly, instead of 13 angry Democrats, 17 angry Democrats. And you said you noticed another thing at that rally with the number 17. Well, I mean, if you go research this QAnon conspiracy, it's absurd. And they have all these different numbers they come up with. And it is appearing at different rallies. We've seen this with the John Burch society, going back years ago. And the president, himself, has believed in conspiracies before. His political career was very much launched on how he came onto that birtherism with President Obama. But there's not really an expectation inside of this White House that the president's going to somehow speak out on QAnon. People inside of the president's inner circle, they see the Q signs as much as anybody in the press pen sees those Q signs. But they believe this is the Republican base. This is the Trump base. They have a deep suspicion of the deep state. Al, this is the Republican base. Are you concerned? Of course. Look, I've lived through this group of people who believe that the moon landing was filmed in a studio somewhere. Right? And we all remember also how our government kept a place in Nevada where all the aliens were incarcerated. But, you know, a lot of people now actually believe that these are actual people in government. This is very different. Now, it's people in government undermining the country. And by them not denying this at the higher levels of the administration, it gives a credibility that further feeds off the idea that government is not to be trusted. Whether it is election security or putting down conspiracies and social media influence, it's about leadership. We saw Senator McCain do this before. When he was campaigning against Barack Obama. "No, no, no, he's not a Muslim." He turned to the crowd and said no. And that shut that down. Same with that press conference on Thursday. The leader of the country is the one responsible for integrating that. We had the top guy in cyber there. He's not there anymore. That's an important point. Clint Watts, thanks very much. We're going to let you go. You guys are having to stick around. When we come back, enter stage left. The progressive Democrats line up to speak at the Netroots Nation Gathering. You got a little hint of it during my interview with Senator Klobuchar. But just as important, the Democrats who weren't there. Stick around. Welcome back. Around here it's never too early to start talking about the next presidential election. And if you're curious which Democrats are thinking of running in 2020, you might get a clue from looking at the lineup of speakers at this weekend's Netroots Nation conference in New Orleans. It's billed as the largest annual meetup of progressives in the country, and it's seen this year as a bit of an audition-of-sorts for Democrats who are looking to shore-up support from the party's liberal base. These past 18 months have demonstrated that the people in power are no match for the power of the people. It's time for us to let people know that what we're seeing in this country doesn't reflect our spirit. What we're seeing in this country doesn't reflect our potential. I'm not waiting, I'm running against Donald Trump today, every single day, okay? And I would say to these politicians: if you don't think impeachment is a good idea, if it's too divisive, then what's your plan? A free and open internet is one of our society's great equalizers. Don't waste a minute of your time feeling daunted that Donald Trump has a base of diehard supporters. So did Richard Nixon before he resigned. We've got to embrace the unshakeable truth that an attack on one of us is an attack on all of us. You bet. Just as notable as what was said may be who didn’t show up in New Orleans. Former Vice President Joe Biden, Bernie Sanders, and my previous guest Amy Klobuchar were among those who skipped it. When we come back, Endgame and the one thing Republicans in 2018 have learned they have to do if they want to run for higher office. Coming up, end game and post-game, brought to you by Boeing. Continuing our mission to connect, protect, explore, and inspire. Endgame. Brought to you by Boeing. Continuing our mission to connect, protect, explore, and inspire. Back now with end game, if you're a Republican running for office these days, there seems to be one rule. And it's a very simple one. President Trump, love him or lose. Tennessee's Diane Black became the fifth House Republican this year to lose a bid for higher office. If your first name is Congresswoman or Congressman, this has not been a good year to be in a Republican primary. But five other House Republicans have won primaries for statewide office. The difference for them? An endorsement from President Trump. A real one. Other Republican candidates have noticed the trend: that the closer you are to Mr. Trump, the closer you are to winning. Here are some TV ads from Republicans who got that message. I'm Todd Rokita. And I'll proudly stand with our president and Mike Pence. My friend Martha McSally. She's the real deal. She's tough. I called Diane Black, and you came through, Diane. I got a big truck. Just in case I need to round up criminal illegals and take 'em home myself. That last one's the nominee for governor of Georgia. Mike Murphy's a longtime Republican political consultant. He joins our panel. He's my ad guy for the week. Mr. Murphy, good to see you, sir. Hello, good to be here. All right. I want to put up two sets of Republican primary ads we're watching. One is in Florida. Here's one that is frankly a traditional Republican primary attack ad. Take a look. Washington is full of bad ideas and phony politicians. Ron DeSantis and his huge tax increase fit right in. All right, tax ad. That seems like a good check. Well, here's Ron DeSantis and the ad that he's running right now in his primary. Everyone knows my husband Ron DeSantis is endorsed by President Trump. But he's also an amazing dad. Ron loves playing with the kids. Then Mr. Trump said, "You're fired." I love that part. Look, I didn't cut out all the issue parts of that ad. Mike, Trump's taxes? Yeah, I know. In the old days, when ideological issues drove the Republican primary, the tax hit would be a devastating one in a Republican primary. But now, because it's all Trump all the time, and issues have been pushed out for this cult of personality, think about this. You have a guy running in the Republican primary for governor of Florida. A state surrounded by oceans, talking about federally building a wall essentially in Texas. And guess what, in the primary, it's going to work. He's been running for governor his whole adult life. This was his moment. And one Trump tweet. Now, I'm going to go to Michigan Senate here. You love Michigan. It's a home state of yours. So, they're fighting over who's closer to Trump. Watch. Here's ad number one. From John James, the candidate. While Sandy Pensler uses the same cheap insults as Democrats and the media to disparage President Trump, "I can't speak at fourth grade level like he does," conservative army veteran John James salutes and respects our Commander-in-Chief. So damaging apparently, that ad, Sandy Pensler had to do a response ad on Trump. Here. John James was busted used deceptively edited videos of Sandy Pensler. He lied. He left out my calling the president smart and a remarkable talent. The truth is I'm a conservative businessman who stands with and voted for President Trump. Yeah, it's like a Stalin trial now. You know, it's unbelievable. You know, you wore a collectivist tie. You're out of order. It - it is the new reality of the Republican primary. But the problem is when Al and I were doing Republican politics, when you run the primary, you wanted to line up an issue profile you could also use in the general election. Like, you're the tax cut guy. Yeah, you're the fiscal guy. You're the small business guy. You're going to fix schools. You put your pitch together. Not only to unify the party, but to go win swing voters. Now, you come out of this thing from the Trump church in the Republican primary with a big Trump halo. But in the general election, Democrats all hate Trump. And among Independents, he's mostly upside down. So, what is your magic light sword in the primary becomes an anchor around your neck in the general. But it - so much of this is stylistic. They want to be seen as pugilist like President Trump inside the G.O.P. But ideologically, you don't see Troy Balderson in Ohio running for the House. They're talking about trade, but they're not taking the hard line on immigration, on trade, in the same way as President Trump. They talk about build the wall. They know they need the enthusiasm. But they're not the same kind of Republicans. But Trump has redefined what the party is. Let me show you something real quick here. These are all the endorsement tweets he does. And they're all probably written by Dan Scavino. It's telling, sending the message of what Trump's Republican party is for. Border security, military, vets. Tough on crime. You don't hear taxes. You don't hear national defense. Not Reagan-like. You know, you don't even hear morality stuff, probably for obvious reasons. Yeah, look, the die is cast. People in the party have decided that he is the general. They're going to win or lose with him. Everybody else is going to be a soldier. And they're moving along with the general in order to try to win the election. It's a high risk, high reward or high punishment situation. And this election's going to be decided by Donald Trump. Let me defend this strategy here for a second. Which is the president says, hey look, it's going to be a referendum on him anyway. Isn't it better for the party, rather than run away from him, "Well, I'm going to get saddled with him whether I like it or not." Is this oddly maybe a way to at least minimize your losses? You know, I - I get that. But the problem is swing states where Trump is so big, there is no easy way out of it. Except building a time machine and finding courage a year ago. That ain’t going to happen. So, in the North Dakota's of the world, this strategy will pretty much work. But in the swing states, it's a lot tougher. Now, the funny thing, the great irony of this, is if you look at who Trump likes to endorse with his tweets, it's people who have done the opposite of him. Served in the military versus bone spurs. A Yale graduate, I believe, down in Florida versus iffy. So, he, it's weird. He's kind of reaching to a persona that's even better than his own with these endorsements. You want to jump in. You know, it's so interesting to me. Previous presidents didn't jump into primaries in their own party in the same way. But Trump has a really strong record jumping into primaries, which is why these primary candidates want his endorsement. I think he's ten and one in Republican primaries at least, or nine and one, in the ten primaries that he's jumped into. But I think Mike's exactly right. Republicans want his endorsement in primaries where the base likes Trump. But among independents, 22-point advantage for Democrats right now. Which makes the Trump endorsement in the primary, a very vulnerable, puts Republicans in a very vulnerable position. All right. We're talking about the Republican divide. Boy, I learned something from Netroots Nation, Helene, this weekend. The Democrats are about to have their own little fight inside the party. I mean, Amy Klobuchar, she didn't look like she was comfortable answering Elizabeth Warren's question about a racist criminal justice system top to bottom. Socialism when she likes it. Socialism. I mean, this is, this is, the Democratic party's about to go through their own Trumpian-like experience here. HELENE COOPER: --where you've got this war. And you have the progressive wing and, you know, the left of the left have been so pissed off ever since 2016 anyway. And they're doubling down on the Kamala Harris’s and Elizabeth Warren’s and Cynthia Nixon. And you're seeing this, this clash right now. I mean, they were throwing spit wads at Mark Warner months ago. So, it’s, it’s, it’s going to be, I think it's just going to be fun to watch. CHUCK TODD: (LAUGHTER) It's going to be fun. ROBERT COSTA: The base on the left is so crowded. It's only summer '18. And you think about all the people competing for that progressive mantle. Keep an eye on Tim Ryan of Ohio, Mitch Landrieu of Louisiana. Could someone from the center, Landrieu calls himself a radical centrist, kind of ride up the center in 2019, 2020? CHUCK TODD: Mike. I feel like we're headed to something. You've got Trump and his base. You may have Elizabeth Warren and her base. That this is what the two bases of the political parties actually want this. "Here, this is who we really are. And you in the middle. You decide. Hold your nose. And pick a side." CHUCK TODD: Is that how the 2020 race is going to be? MIKE MURPHY: Yeah, it's normally a card trick. Pick any card you don't want. The problem is there's a great appetite for a centrist, but there's no distribution system. We're not built for 7-Up to be number one. It's Coke or Pepsi. Because that's the distribution. It's very hard to run a third party candidate. And then, you wind up in the electoral college, where you got to ask the two parties to put themselves out of business. So, my bet is you're going to have somebody Trumpian. But, look, I do think if we have a bumpy midterm, the whole Trump thing in '19 could be a whole new ballgame. MIKE MURPHY: And on the democratic side, the muscle's on the progressive side. CHUCK TODD: All right, guys. I'm going to pause it there. We got to do real politics today. Fun. Before we go, I got a quick programming note for you. Tomorrow night, my colleague NBC News anchor Lester Holt will sit down with director Spike Lee about his new film, BlacKkKlansman. It's coming out one year after Charlottesville. And he'll also be speaking with the film's subject, Ron Stallworth. That's all we have for today. Thanks for watching. We'll be back next week. Because if it's Sunday, it's Meet the Press. ANNOUNCER: You can see more end game and post-game, sponsored by Boeing, on the Meet the Press Facebook page.